This image is NOT the plan proposed by H-E-B, but it is illustrative of a Win-Win Solution to keep Main Avenue open. San Antonio Current reporter Mary Tuma contacted me for her article following up on H-E-B’s plan to privatize the section of Main Avenue on the south edge of downtown. 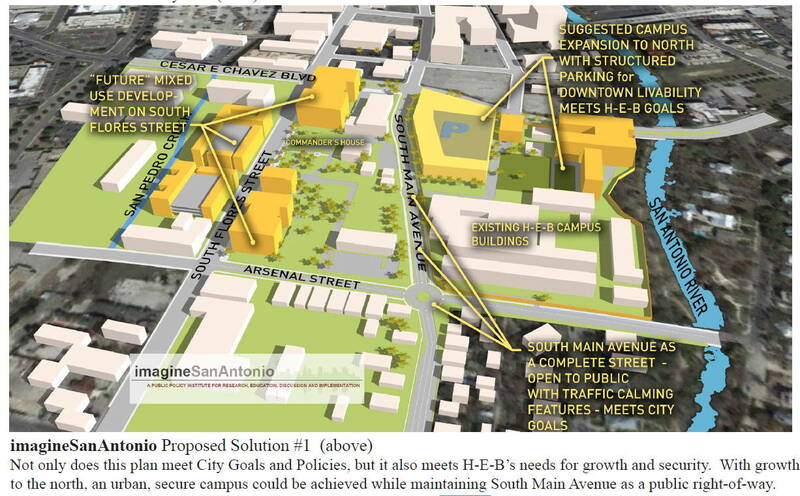 H-E-B’s bid to to create a suburban style campus downtown sailed through city council as widely expected. Council’s action is an approval to create an automobile-oriented superblock, which not only is contrary to urban planning best-practice principles; but more heinously, it is contrary to the democratic institution of community-input planning the city has been conducting. It is reveals an ugly side of our city’s processes: special interest lobbying and top-down management. The citizen-input public-planning processes which occurred over the past few years along with enacted policies for redeveloping a more livable downtown should stand, be respected and should have categorically thwarted the private corporation’s deep-pocket real estate play that contradicts the public-input plans. H-E-B should have come to the community planning meetings and openly voiced their objectives. They should have sought resolution in the public-planning arena. Instead, public land, a right-of-way, is being traded for a gas station and jobs. Job creation is an important component of the community’s plan, but not at the expense of the larger goal: to create livable communities that integrate all goals. The sad part of this situation is that H-E-B could accommodate a higher number of employees without taking over public land (See illustration by imagineSanAntonio, above, and as issued in their Press Release.) The city could have worked with H-E-B to create a vibrant campus that would reflect the thriving, progressive city Mayor Castro’s SA2020 initiative projects. The surrounding community could have retained its vision for livability. Thinking idealistically, I wonder how can our city evolve so that powerful corporate interests and the real estate oligopoly genuinely participate in community-based urban planning processes? ….Proponents of the $100 million expansion point to the allure of job growth. While the promise of new employment brought on by the 10,000- square-foot store remained vague for some time, the City’s Development Office cleared the confusion up at the early December meeting, saying H-E-B will employ 800 workers by 2020 and an additional 800 employees by 2030—50 percent of these will be new jobs. Mayor Julián Castro said he understood concerns of the residents affected by the partial Main Street closure but that the chance for economic development was worth the investment. “We have on the table an opportunity to create a significant number of jobs in the urban core of the city and create a grocery store that I believe will further catalyze the revitalization of downtown,” said Castro, of the 1,600 estimated jobs. To mitigate walkability and cyclist concerns, H-E-B also promised to create a 30-foot pedestrian and bike amenity zone, re-open Whitley and Dwyer Streets, ensure ADA-friendly walking paths, arrange and replace or preserve the bike route and pedestrian path through South Main Avenue and enhance pedestrian signals and crossings. The street upgrades must be made before closing Main Avenue, City representatives said. However, the mitigation improvements didn’t do much to help assuage critics’ qualms. Bogle, co-chair of the local chapter of the AIA Urban Affairs Committee, has presented against the H-E-B site at City zoning and planning commission meetings. He argues the plan is “antithetical” to most of the citizen and public input policies that are in place here in San Antonio, pointing to the Lone Star Community Plan, which shows residents favor high-density, public transit-oriented, mixed-use developments in the core. “What they are proposing is anything but this,” says Bogle. “It’s a low-density, single-use parcel and very much automobile oriented—it’s not what our downtown needs.” In fact, says Bogle, the new store will negatively affect SA2020 goals, including miles traveled, public transit ridership, travel time and air quality indexes as well as walkability scores…. via H-E-B’s Main Ave. Plans Passed Council, Now Citizens Want Oversight – News and Politics – San Antonio Current. By Mary Tuma. Posted in blog, publications, urban. RSS 2.0 feed.